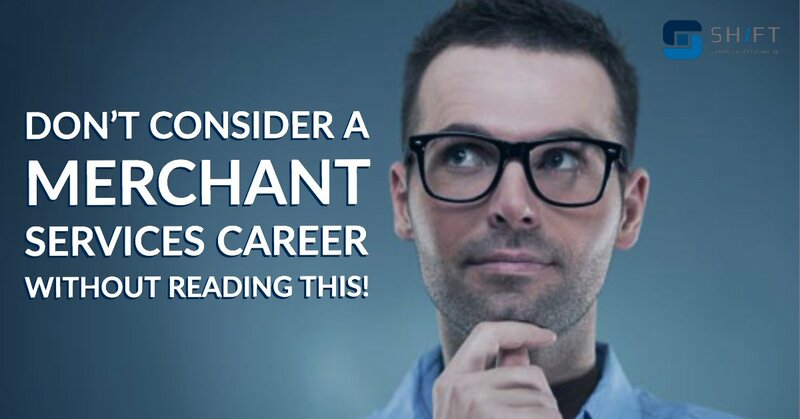 Don't Consider a Merchant Services Career Without Reading This! Don’t Consider a Merchant Services Career Without Reading This! There are a lot of benefits to a merchant services career, but that doesn’t mean that it’s the same for everyone. A merchant services career will allow you to sell credit card processing to businesses that need it, but you shouldn’t make a hasty switch. If you’re considering switching merchant processing careers, or if you’re entering the field for the first time, read this article to learn how the right processing company can optimize your skills, give you a sense of security, and make you more money. Darla sells credit card processing for Hoax Processing Incorporated. She doesn’t love her merchant services career, but she feels like there is no better option for her. She’s doing ok, but she feels trapped in a job where she’s not flourishing at the level she should be. He sells merchant services for Shift Processing. Ralph loves his career. He feels confident in his skills as a sales rep, and his hard work is already paying off. What makes Darla and Ralph’s situations so different? They both work hard in a merchant services career, but the outcomes are drastically different. It all comes down to the companies they work for. Let’s take a closer look at the differences between Shift Processing and its competitors. Any career will affect your day-to-day life, but what does an average day look like for Darla and Ralph? Selling merchant services looks different for both of them, and it surely affects their overall feelings about their jobs. Darla wakes up at 7 am every day to cold-call businesses. Her job gives her the illusion that she can make her own schedule, but she’s required to meet an ever-increasing monthly sales quota that forces her to work long hours every day. Darla spends her day visiting businesses. She tries to teach them about her company’s merchant services, but the best she can offer them is slightly lower rates. Most business owners don’t want to go through the hassle of switching processing companies for only slightly lower rates, so she has trouble getting them to agree to talk to her. When she does finally land a sale, she has to go through an extensive process of switching the business over to her company. The paperwork is lengthy, and her customer is hesitant to sign a one-to-three year contract. When she finally completes her day at what feels more like a temporary job than a career, she goes back home feeling like she has nothing to show for all her hard work. On days where Ralph is excited to start his day, he’ll set his alarm for 7 am and hit the ground running. On other days when he just wants to stay in bed a little longer, he’ll sleep in and enjoy a relaxing morning. He may stay home and call business owners over the phone, or he may take the day off. It’s completely up to him. Ralph has no monthly sales quota to meet, so he has the complete freedom to shape his schedule to his desires. When he goes out cold-calling, business owners are excited to talk with him about eliminating 100% of their processing fees. Ralph has no problem selling Shift’s merchant services. With no monthly fees or year-long contracts, the service practically sells itself. Every time Ralph makes a sale, the process is super quick. The merchant application is short, and customers appreciate that all of Shift’s business is done month-to-month. When Ralph returns home at the end of the day, he feels satisfied knowing that all his hard work will pay off. Everyone hopes that their job will earn them a good income. Both Darla and Ralph work hard for their money, but only one feels like his paycheck reflects the work he does. Darla knows that she should be earning more, but she doesn’t know how to make it happen. The businesses that Darla has signed aren’t making her the money she would like. She has a portfolio of clients, but she only makes an average of $900 a month. With this income, she doesn’t have enough money to put toward her goals or hobbies, and she has to go out and sell to more business or she won’t make rent for that month. When Darla makes a sale, her company’s restrictive contracts and monthly fees don’t allow her to make much money off of it. She’s building the organization’s bottom line at her own expense while her company is pocketing 90% of her account’s profitability. The stress from Darla’s job makes her feel trapped. She makes a residual income from her sales, but she’s always nervous that her customers will leave her for a better processing company. Because of her limited income, Darla lacks a sense of security in her merchant services career. Ralph loves the money that he makes, and he’s excited to know he can make even more! At Shift Processing, Ralph has the ability to eliminate 100% of his customer’s credit card processing fees. As a result, he makes an average of $10,000 a month! Not only are more companies excited about signing on with him, but Shift gives him a higher percentage of the profit from each account. Ralph doesn’t stress about his customers leaving him for another business. He’s confident in the service he sells, and he knows that the deals he’s signed will give him a residual income for life. Do you relate to Darla? If you’re in a merchant services career that leaves you feeling trapped and insecure, it may be time to consider a switch in processing companies. Shift Processing gives you all the opportunities you need to succeed. If you’re considering a new career in merchant services, you’ll want to model your job after Ralph rather than Darla. Make sure you pick a company that cares about your goals as much as you do. Want to learn more about selling credit card processing? Check out our Credit Card Processing Careers post! Ready to pursue a career with Shift? Learn more about all we have to offer and sign up today! Previous Post Switching to a Merchant Services Career: Everything You Need to Know Next Post Merchant Services Careers: How Much Money Can You Make?